That cover sure is awesome! I haven’t been reading Amazing Spider-Man for a while – as much as I really enjoyed Dan Slott’s Spider-Man run for a while, and even contested he was born to write Spider-Man, I did eventually get bored of the direction he was taking it. If this is his last arc though, I might need to check it out when it’s done. Amazing Spider-Man is a series I tend to get every now and then. Like you, I found some recent storylines a bit lacking. Think it was a good move to bring Peter Parker back down to earth a bit with him losing his company and money ect. This is Dan Slott’s final arc, so it will be interesting to see how he closes out his run on Spider-Man. I’ve enjoyed his work on the sereis for the most part. Will you be checking out Invincible Iron Man when he takes over writing that book? Probably not. I’m not that much of an Iron Man fan – his appearances in other books and the movies are generally enough for me. I might check it out, I’ve read Iron Man occasionally over the years. Will be interesting to see Slott’s take on the character. Love it. That’s one cool and insane cover. I love how the Goblin is smashing through the Spidey signal – looks stunning! Looks like Slott is saving his best for last with this arc. As a writer Slott has been on the whole a good fit for Spider-Man and the return of Osborne is a great way to finish an epic run. Looking forward to picking it up. Slott and Spidey have been killing it lately. One of my fav books at the moment. Great review. That cover artwork is AMAZING. 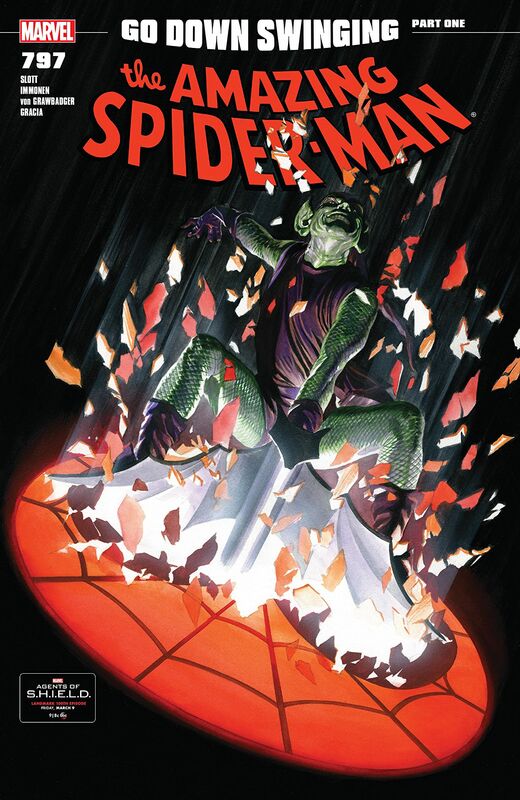 Its one of my favourites that Alex Ross has done for the series, I love how the Goblin is smashing through the Spider-Man signal, looks so menacing! Glad you enjoyed this issue of ASM too Paul, I’m eagerly awaiting #798 – which sadly brings us one more closer to the end of Slott’s run. This storyline in ASM is really building to an epic showdown between Spidey and the Goblin! Yes, looking foward to #798 as well. I’m going to miss Slott on this title, I’ve not read all his run, but I’ve enjoyed what I have read. Will be interesting to see how the sereis continues after Slott’s run, and what happens next in Peter Parker’s life. I love Alex Ross art. I need to read more Spider-Man comics. The idea of having Carnage and Osborn is something terrifying. Alex Ross has done some awesome covers for Amazing Spider-Man. His artwork is brilliant! I agree, Carnage and Osborn make a frightening combination as the Red Goblin, one of Spidey’s most deadly foes for sure! He does and I love it. The Red Goblin sounds like trouble. He has the symbriote powers and the knowledge and evil of Norman. Indeed, Red Goblin is a powerful foe, and will uses all his knowledge together with the symbionts power to destroy Spider-Man. Its all building up to an epic showdown in Amazing Spider-Man 800! 800 issues?! That’s a high score. I feel like the team are planning something big for Spider-Man. This big storyline has been the build up to this special issue, and it looks sets to be an epic Spider-Man story. I am actually surprised Norman Osborn is back and trying to kill Spider-Man. I always thought he would be dead from his actions. I think he was believed dead for a long time and then he returned. He did loose his powers and memory that Spidey was Peter Parker for a while as well until he got all his memories back in this Spider-Man storyline. Oh really? His powers are the Goblin powers? Yes, that’s right, from the process that originally made him the Green Goblin. Now of course his power and evil is augmented further because he has bonded with Carnage. A deadly combination indeed. That’s scary. Knowing Carnage, he will unleash the killer instinct. Indeed, and no one that Peter Parker knows will be safe when he does, its going to be an epic showdown between Red Goblin and Spider-Man! I agree. I hope he doesn’t die like in Ultimate Spider-Man. I doubt that will happen. The Amazing Spider-Man comic book sereis is being relaunched though soon when Dan Slott’s run is over, so it could herald a reboot of sorts perhaps? We shall have to wait and see. Oh really? He is a great comic artist. I think this reboot will be part of the new Marvel comics that will be happening this summer.